A new long-distance route that will lead walkers on a trail through Fife’s pilgrim past will be formally launched this summer. Fife Coast and Countryside Trust secured funding in 2017 to create the Fife Pilgrim Way, a 64-mile path taking in spectacular views, medieval landmarks, industrial landscapes and historic picturesque villages. Starting at Culross and North Queensferry, the route will follow the region’s existing network of rights of way, paths and tracks all the way to St Andrews. The name is a nod to Fife’s history as a religious destination for pilgrims between the 11th and 16th centuries. 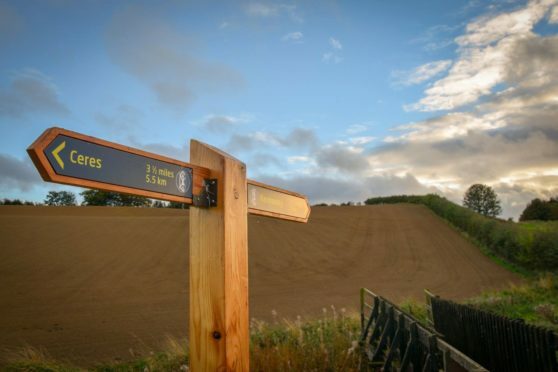 Miranda Lorraine, Fife Pilgrim Way community and business engagement officer, said the official launch of the route has been pencilled in for early July, with the path works, sign posting and waymarking now complete. The only outstanding issue is a restoration agreement relating to the St Ninian’s opencast site. Members of the project team are working with Fife Council and site operators Hargreaves to find a solution. Once resolved, they we will be in a position to open the entire 104km/64 mile route from Culross and North Queensferry to Dunfermline Abbey then on to St Andrews Cathedral. Ms Lorraine said: “Our focus is now very much on delivering the interpretive elements of the project, which will enhance the walking experience for those many thousands of walkers planning to walk the route”. Eskimo Design, Differentia and the Fife Coast and Countryside Trust Team are working to create eight orientation panels, nine cast metal discs and four stone rest points that will be sited along the trail. Other projects will include a free leaflet, a book, maps and Fife Pilgrim Way merchandise. A travelling exhibition entitled the Pilgrim Express is also being developed in partnership with the Fife Cultural Trust, and will tour in Fife’s Mobile Museum Mac for the next two years. Walking enthusiasts have been urged not to try to follow the route before a designated map is published in the interests of safety.